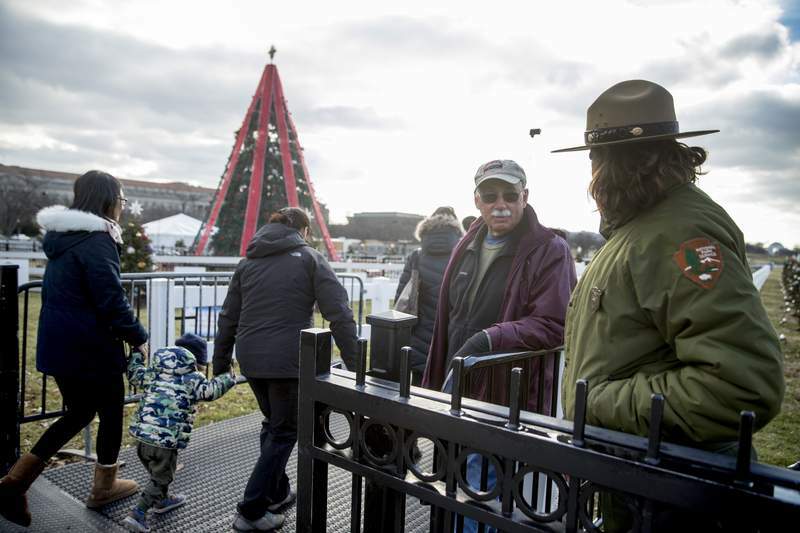 Associated Press National Park Service employees open the National Christmas Tree near the White House on Monday. The tree had been closed to visitors after it was damaged by a climber Friday. WASHINGTON – In a Christmas season of drastically reduced ambitions, perhaps this qualifies as a miracle. The National Christmas Tree that sits behind the White House was reopened to the public Monday after becoming an unfortunate totem of Washington's political dysfunction when it went dark over the weekend amid the federal shutdown. The tree and its lighting had been damaged by a rogue climber Friday, and it was unclear whether it would be fixed in time for the holiday. But the private sector stepped in when the federal government could not. The National Park Foundation, a nonprofit that is the official charity to help private money improve the national park system, gave the National Park Service enough money both to investigate the damage caused by the climber, and keep the park open and lighted through Jan. 1, it announced Monday. “The National Park Foundation's support to President's Park is one example of how private philanthropy can help support national parks when they need it most,” Will Shafroth, president of the National Park Foundation, said in a statement. The darkening of the tree, which sits in a park just below the White House's South Lawn, was the result of two seemingly disparate events on Friday evening. In one, the United States Congress failed to come up with a passable budget after disagreements about who would fund President Donald Trump's border wall, requiring the government to begin shutting down after midnight. In the other, a man scaled about 15-20 feet of the tree, which damaged it and its lighting, the police said. A National Park Service spokeswoman told the Washington Post that night that the tree lights would remain off while the damage the man caused was assessed. Then the shutdown came at midnight.